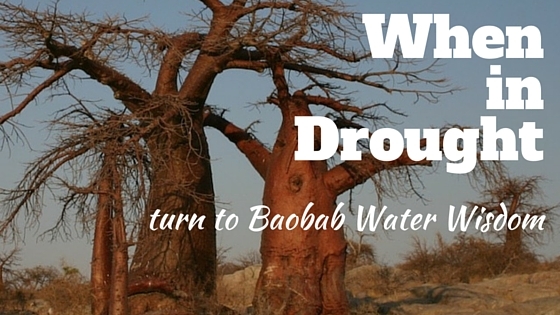 World Water Day: when in drought, consult a baobab tree! Baobabs have a very shallow and wide-reaching spread out root system, as opposed to a tap-root system. This means they are able to absorb water from the first rains and from the shortest of showers. 2. Store Your Water in a Trunk? Fix all dripping taps and leaking pipes, collect rainwater, use a grey water system to re-use household water waste, and don’t let usable water simply run down the drain. You can even use water you’ve used to cook pasta or vegetables to water plants once its cooled down of course. Baobabs are very careful consumers of their water, only using it when they really have to; for leaf growth, flower growth, photosynthesis and for basic survival.